This week, Marvel's Doctor Strange became the latest superhero to officially join the MCU, with Benedict Cumberbatch effortlessly rocking the character's two most famous accessories, the Cloak of Levitation and the Eye of Agamotto. As is par for the course with any comic book-related property, the film is packed with a number of fan-pleasing details and references that reward close attention. 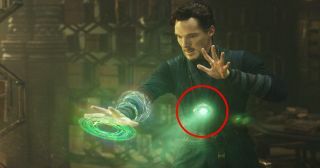 Below, we've rounded up a comprehensive list of Doctor Strange Easter eggs, but tread carefully if you haven't yet seen the film, as there are SPOILERS ahead. As the film begins, Avengers Tower (formerly Stark Tower) is clearly visible in the opening shot of New York. In terms of the MCU timeline, this places Doctor Strange after the events of the second Avengers movie, something that's reinforced later in the film when Wong (Benedict Wong) says, “The Avengers protect the world from physical dangers – we safeguard it against more mystical threats”. When a mysterious-looking book was first glimpsed in the Doctor Strange trailer, eagle-eyed Marvel fans pegged it as The Book of the Vishanti, a key Doctor Strange artefact that's as important to the character as the Cloak of Levitation or the Eye of Agamotto. In fact, the book is The Book of Cagliostro, which is taken from a specific comic story that's very close to the plot of Doctor Strange, in which Karl Mordo steals the book intending to use its time-travel properties to destroy the Ancient One. Interestingly, in the comics, The Book of Cagliostro contains passages of the Darkhold, the ancient book that's currently a key plot focus in the latest series of Agents of SHIELD. How's that for a deliberately obscure crossover? Rachel McAdams' Christine Palmer is one of a trio of characters who've been called Night Nurse in the comics, though, confusingly, it was her colleague Linda Carter who had the relationship with Doctor Strange. The TV wing of the MCU already has a Night Nurse in the shape of Claire Temple (played by Rosario Dawson), who's so far appeared in Daredevil, Jessica Jones, and Luke Cage, though Temple was a composite character, combining the Night Nurse idea with an existing Luke Cage love interest by the same name. Still, having more than one Night Nurse is entirely in-keeping with the original 1970s comic, which proves that Marvel are nothing if not faithful to their source material. The wifi password gag actually refers to a Doctor Strange graphic novel called “Into Shamballa”, in which, Strange is offered the chance for mankind to enter a golden age, but discovers that the price is too high. The name itself alludes to a mythical hidden kingdom in Buddhist and Hindu tradition. Towards the end of the movie, Wong casually lets slip that the Eye of Agamotto (the powerful, green glowing amulet that Strange wears around his neck for the second half of the film) is one of the Infinity Stones, which means that purple space baddie Thanos will be coming after it at some point during Avengers: Infinity War. Fans of the traditional Stan Lee cameo can relax – not only does he appear as usual in Doctor Strange, but he's also filmed scenes for the next four Marvel movies. Lee's cameo in Doctor Strange is up there with his best appearances – he's seen on a bus, laughing out loud while reading Aldous Huxley's The Doors of Perception (about taking the psychoactive drug mescaline), oblivious to the destruction happening in the Mirror Dimension outside the bus window. 7. Experimental armour, you say? Early on in the film, before Strange has his fateful car accident, he's discussing potential cases on the phone and we hear the line: “I've got a 35-year-old Marine Colonel, crushed his lower spine in some kind of experimental armour". This could refer to Rhodey/War Machine, who got his spine crushed and suffered paralysis in Captain America: Civil War, except for the fact that Rhodey isn't 35 – he's meant to be in his mid-40s. Still, let's pretend that the nurse got his age wrong, because you can't very well mention experimental armour in a Marvel movie and expect us not to think it's related to Iron Man somehow. It's established in Doctor Strange that mystic weapons choose their owners. The wand wielded by Wong is the Wand of Wattomb, an extremely powerful object capable of blocking mystical attacks or unleashing blasts of energy. Its presence is significant, as in a previous appearance (in Spider-Man: The Animated Series), it was stolen by Mordo and used to open a portal to release Dormammu. In the first of two post-credits scenes (this one directed by Taila Waititi), Doctor Strange is seen having a casual meeting with Thor (Chris Hemsworth), during which a) Thor downs a couple of magicked-up pints of ale, and b) Strange mentions that Thor's brother, Loki, represents a serious threat. As a result of their sit-down, Strange agrees to assist the Avenger in his search for his father, Odin. This is a strong hint that we'll see Doctor Strange in Thor: Ragnarok, something that hasn't yet been officially confirmed. If that's the case, it could make for a fun Earth-bound team-up sequence before the Asgardian action kicks off. The character played by Michael Stuhlbarg was introduced in a 2006 comic called Doctor Strange: The Oath. True to his comics history, West is the doctor who performs the surgery after Strange's accident, though he's ultimately unable to save his hands. In the comics, West follows Strange to Kamar-Taj, where he is also trained by the Ancient One and learns the essentials of mystical healing. The casting of such a well known actor in a relatively small part suggests that Marvel have bigger plans for the character further down the line. One of the most surprising cameo appearances in the film is that of Tina Minoru (played by Linda Louise Duan), who's briefly seen as one of the Masters of Kamar-Taj, receiving training from the Ancient One. Rather than a Doctor Strange supporting character, Minoru is a key figure in the acclaimed series Runaways, in which a group of children discover that their parents (Tina included) are part of an evil crime organisation known as The Pride. However, it's likely that there's a little more to it than that, given that there's a TV show of Runaways currently in development, courtesy of the creative team behind Gossip Girl and The O.C. The guardian of the New York sanctum who gets killed is named as Daniel Drumm. In the comics, the spirit of Drumm is merged with that of his brother, Jericho, who becomes Haiti-born superhero Brother Voodoo. It's an interesting reference for the film to make, given that, in his most recent comics incarnation, Brother Voodoo (now Doctor Voodoo) takes over from Doctor Strange as the Sorcerer Supreme. Strange and Voodoo have been both friends and enemies over the years, so it's entirely possible the writers are laying some groundwork for a future Doctor Strange sequel.